Star Nails are the developers and manufacturers of professional nail care products. The Star Nails Company was founded in the year 1981 and has its headquarters in Valencia, California, United States. The company offers accessories such as acrylics, brushes, disposables, acrygels, glues and treatments, UV nail colors, implements, nail tips, pedicure products, UV gels, sanding implements, sanitation, and UV LED lamps. The Star Nail International involved new technology for the production of eco nail systems. The products can be purchased from its website online. 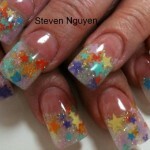 The Star Nails also provides demos, videos, and seminars for nail arts and trendy nail styles. There are currently 0 consumer reviews about Star Nails available. Share your review. Please take a note that you are about to post a public review about Star Nails corporate office on CorporateOffice.com. This review will be public, so please do not post any of your personal information on this website. If you would like to contact the corporate offices of Star Nails, please use their contact information such as their phone number, website, and address listed above to contact them. However, sometimes staff from Star Nails headquarters do read the reviews on this website.